Inflatable hot tubs are taking over UK gardens, owing to an incredibly low price-point that means almost anyone can own their own luxury spa. Many of our users have installed them alongside their decking or other garden structures – and we’re all for any products that get more people out in their garden enjoying the outdoors. In this article we review some of the best square hot tubs on the market. Depending on your needs, these tubs have some distinct advantages over traditional circular spas. Because of their rectangular shape and right-angled corners they fit flush with other objects in the garden, including decking and garden edges. They also typically have greater water capacity (circular spas essentially have their corners cut off) which means more space, greater comfort and less people sat jealously waiting in the cold to get in. Add to this the fact that most of the best-rated products on the market have four corners, you can’t go far wrong with one of these tubs! 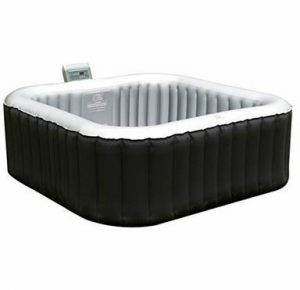 Section 1: What Are the Best Square Inflatable Hot Tubs? Section 2: What Are the Pros & Cons to Buying a Four-Corner Spa? Our experts have tested and audited the primary products on the market to assess their quality, credibility and value for money. The product you ultimately choose will probably be dependant on your garden size, requirements and budget – but we hope our experiences can help you make an informed decision that’s the right one for you. The Mspa Alpine M-009LS is in our opinion the best square hot tub in the UK right now. While it might not have the established name and advertising budget of Lay-Z-Spa, what it lacks in stature it makes up for in product quality, cost and value for money. With a max temperature of 43° it can get hotter and maintain warmth for longer than any of the other similar products on the market. It also comes with 108 – 132 air jets, meaning it can match any product out there for bubble jet functionality and comfort. It has a preconfigured, four-seat design that means everyone has their own space to relax in. These seats are preconfigured in 2×2 shape, with any occupants facing each other. Unfortunately this does make it difficult to fit any more than 4 people in the spa at any one time. 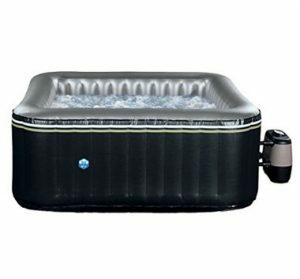 In terms of other features, the tub has a reinforced PVC exterior to prevent punctures – often a common problem with inflatable spas. The pump motor is also incredibly quiet to run, which is always important for maximum relaxation! The low water capacity of the M-009LS (just 650L) is one of its only downsides, limiting the amount of room available, though the preconfigured seating definitely helps to part nullify this. Reduced water capacity also means of course that running costs are reduced, as less water is being kept at high temperatures. If we could change one thing it’s that there is no extended warranty offered with this product, something that Lay Z Spa & Netspa have nailed with their 1 year warrantee and UK support. For this reason we’d generally recommend buying the Mspa Alpine from Amazon UK, whose support team are generally very sympathetic to any problems and will usually help sort a product replacement or refund if there is any defect inside 12 months of purchase. Probably the best known brand in the world of inflatable hot tubs and for good reason. They have developed a number of product USP’s which have helped to propel them into popularity in the UK. Key features include a dual operating heating & air jet system, meaning that one needn’t be turned off while the other goes to work. While this does mean a small sacrifice in the max temperature of 40°C, it really isn’t noticeable and using both systems at the same time is incredibly convenient. The big selling point for the Hawaii Airjet is its capacity, which is the largest available for any square-shaped tub. At 840L water capacity there’s plenty of room to fit up to 6 people at a time. We highly recommend this product if comfort is your main concern. So why wasn’t this product our top pick? Well, not only is it the most expensive product on our list, it’s also the costliest to run. Its high water capacity means higher electricity bills. Before buying, you should also note that some Lay-Z-Spa customers have complained of issues with punctures and faulty LCD displays. While these do seem to be quite rare, we were concerned by reports of user queries being answered slowly by the UK support team. Definitely worth bearing in mind if you are buying direct from the manufacturer. This being said, we love almost everything about this tub. And based on the product reviews on Amazon, so does everybody else! If you can afford to splash out a little more then we suggest you should go for it. The Netspa Aspen is one of the newest products on our list, released in early 2017. It inflates in just 2 minutes, fills with water in an hour and takes roughly 20 hours to heat up to optimum temperature. The product claims to fit 4/5 people though at only 700L we found 5 people to be an incredibly tight squeeze. We’d only advise you buy this spa expecting to fit 4 people max – or you might wind up being very disappointed! Aspen have managed to reduce heat loss and increase efficiencies from the spa pump meaning this product is the cheapest to run of the hot tubs in our list. If you’re concerned about the impact a new spa is likely to have on your electricity bills, this is the product for you. Unique features include a number of upgrades to prevent damage, including a reinforced outer wall to prevent punctures and a pressure-release value to help prevent over-inflation. This probably explains why Aspen are also happy to offer a 1 year warranty on the pool skin and LED operating unit. Because this is still a relatively new product, we do advise caution. There’s little in the way of online feedback at the moment which means it’s difficult to collate feedback from the experiences of other customers. In summary we felt that the Aspen 4/5 Person does less than Mspa Alpine, but at a greater cost. For this reason it’s last in our list of four-corner spas. Section 2: What Are the Pros & Cons to Buying a Square Spa? 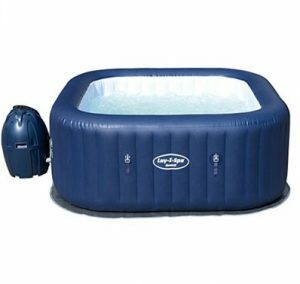 Ultimately this is a choice that depends wholly on your personal preferences and the amount of space you have at home, but there are generally some distinct advantages when it comes to square inflatable hot tubs. An increased water capacity which means more space to relax in – and more people to relax with you! Edged sides and corners make them a great shape for gardens which are typically rectangular. This means they can fit flush against fencing, brick walls, decking and other garden furniture. Straight sides better support the back, making the whole experience a lot more comfortable. Of course this does depend on personal preference. Increased water capacity means the amount of water you need to heat increases – ultimately meaning they cost more to run. Depending on how often you use the spa, they could cost up to £5 extra per month in electricity costs. The spas are inflatable, which means you should always use caution when placing them near potentially serrated objects such as walls or fencing, where splinters/rocks could puncture the outside walls. If you’re planning to install a gazebo over your new tub to protect it from the elements, it also makes sense to look at a product of this shape as it’s much easier to find a gazebo that matches your parameters.